verb (used with object), rogued, ro·guing: to uproot or destroy (plants, etc., that do not conform to a desired standard). : to perform this operation upon: to rogue a field. My project involves the unseen hazards that surround us in our lives (Perhaps they are encased in a S.E.P field*). It's not that they're invisible, but they're so common people will walk out into traffic rather than take a moment to make a phone call, or break/cut off a low branch which is blocking a sidewalk. These issues are so ordinary, I've seen trails worn into the planter strips where people will walk around the low branch for so long that the branch grew to be over 6 inches in diameter by the time I found it. I, on the other hand, simply cut it off, and in the process, reopened the sidewalk in less than 10 minutes of work. Really, is it such an issue that really needs to be addressed? The simple answer is yes. All too often, we take our ability to see (or our ability to walk around an obstacle) for granted. What if you didn't have that ability to see (or walk) then where would you be? Just because you have these abilities today, can you be certain that you'll have it next week? Next year? Thirty or forty years from now? Let's take the tree branches seen in the photo to the left. They look small, they look easy to brush out of the way. Until you take a closer look at them that is. This non-native species is actually black locust. It was introduced to Oregon by pioneers who used it for their fence posts. It is a fast growing, reasonably strong wood that resists decay... All good things right? Well, it was then. However, now it is an invasive species. Besides the fact that the fruit of the tree is toxic, it spreads quickly, and is covered in pairs of 1/2" to 2" long hard spines that grow every few inches on the branches. The new branches like to spread out from ground level, and left unchecked, will grow at face level. 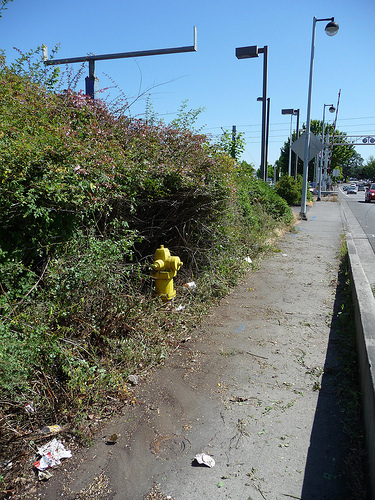 Additionally, its roots frequently heave sidewalks up. Now let's step back for a moment. Imagine if you were a person who was legally or completely blind. How do you find these branches? Too often you'll find it right in your face. Nasty scratches and puncture wounds are the result. Even with the branches removed, the sidewalk is damaged which poses a tripping hazard that can even bring down a sighted person. Worse yet, these fast growing trees reproduce by suckering. Any chance they can sprout in a spot of dirt, and they will. Those nasty spines keep sighted people away from them until they are such a nuisance that the need to be ripped out, and the sidewalks need to be replaced. Now, not all branches that overgrow sidewalks/bike lanes have such nasty surprises hiding in them. How many times have you walked around a low branch or ducked under it? How long will you continue to do so? Days? Weeks? Years? How hard would it be to just reach up and snap a small branch off when you notice it making you change your path. This damage will quickly heal, and not seriously harm the tree, However, when left alone, these branches can (and will) continue to grow. For example... How long did it take for this branch to grow this big? Take it from me, those ladies were not tall, and I took the photo from my face level. Of course it wasn't the best thing for the tree. Because it was allowed to grow unchecked over the sidewalk, something (probably a child) managed to break the branch. Damage like this allows insects and diseases to attack the tree. Each time that crack expands, new tissue is put at risk. The best solution would have been to remove the branch when it was small, but that was a long time ago. 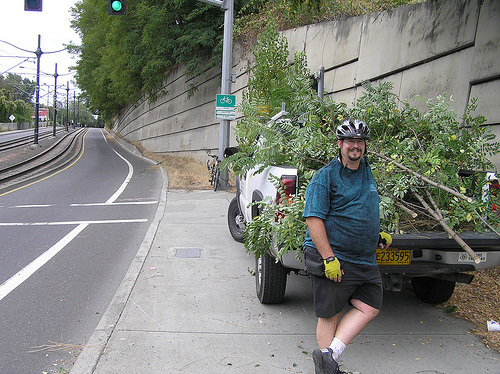 After removing the branch, you can see that the sidewalk is much more accessible by nearly everyone. That man is easily 6' tall. Now let's look at other everyday hazards... Storm drains anyone? Storm drains are designed to allow the roads and sidewalks to drain rainwater away, while keeping debris out. Of course this one didn't work so well. 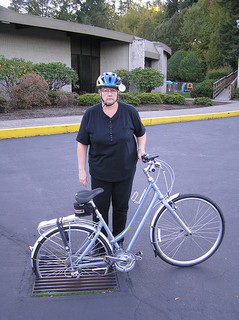 This rider was riding her new bicycle through this Church's parking lot on her way to a trail when she realized that there was a storm drain grate in the way. Fortunately for her, her front wheel made it (and she avoided being thrown over her handlebars face first to the asphalt below). Unfortunately for her, her rear wheel didn't. 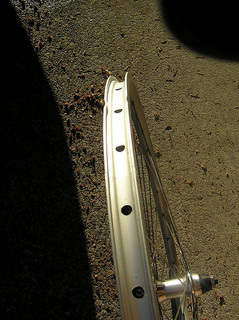 Her rear wheel was damaged beyond repair. Of course the photo on the left was a reenactment of the real crash, and the photo on the right shows the real damage. I've been told that the average storm drain grate costs $300.00. That seems like a lot, until you compare that to what Portland paid out to a single bicyclist hurt when a poorly designed storm drain grate (which has been illegal in the state of Oregon since the 1970's**). Gary Dunkley received $100,000.00 when he was hurt when his wheel hit a storm drain grate. Let's divide $100,000 by 300, and whoa... 333 1/3 storm drain grates could have been replaced by that. Back to sidewalks again. Let's talk about boneheaded placements of signs... Or, really, the remains of former placements of signs. 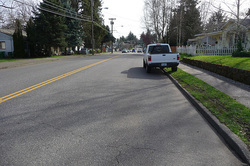 This sidewalk in Tigard is the responsibility of ODOT (the Oregon Department of Transtportation). I found this sign's base as you see here. Let's imagine for a moment, a person is walking on the sidewalk (a perfectly reasonable thing to do on a sidewalk). Now that person is either texting, or using a cell phone (both perfectly legal activities). That sign's base is not really obvious, especially at night, or in wet conditions (both reasonable expectations as this is Oregon). One moment of distraction, and that person falls. Now most people wouldn't think that a fall is a big issue. However, for my family it is. My Great Grandmother died following complications of hip replacement surgery on Christmas morning 1991. Any guesses on how she broke her hip in the first place? Granted, her fall wasn't on a sidewalk, but still it was a fall. I still remember the look on my Father's face when he took that call Christmas morning. I don't remember anything about what I got that year, but I do remember that look. Back to the sidewalk. Trip hazards are everywhere, from heaved sidewalks due to tree roots, or cracks in the sidewalk caused by soil erosion or settling. Notifying the adjacent property owner, or code services is the best way to get these addressed. In the case above, I flagged down a Tigard police officer, showed him the hazard, and he reported it to Public Works. 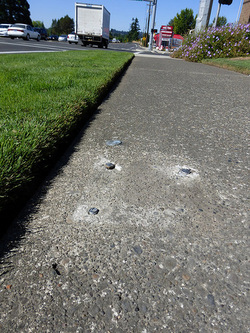 As it was a weekend, I called ODOT on Monday, and before they could respond, TPW had removed it (and cut the bolts flush w/the sidewalk). ODOT dispatched someone to remove it, but found it was done already. Total time elapsed between complaint and removal, approximately 48 hours. Not to be confused with the people who use Google's product, glASSholes are the people who deliberately toss glass bottles on sidewalks or into bike lanes, or tow truck operators who shirk their responsibility to clear crash sites of broken glass and debris. Presuming that an individual isn't the specific target of an attack, the hazard is to people who are wearing thin soled shoes (Crocs/flip flops), pets, and bicycle tires. The fix is to simply sweep up the mess, or report it to an agency that can. In this image we see a number of problems (mind you, I'd already begun cutting the brush back before taking this photo). Here we have a classic fire hazard. No, not because the brush is dry, but because of what it conceals. This fire hydrant was only visible AFTER I had begun cutting the brush away. How long was that brush allowed to grow until it completely obscured the fire hydrant from view. Imagine if you were one of the people living in the condos next door to this and you needed a fire to be extinguished. My sister is a firefighter, I don't need her, anybody she works with, or anyone she is trying to assist in an emergency put in jeopardy because of some stupid bush hiding a much needed resource at a critical moment. Back to sidewalks... The Americans with Disabilities Act went into effect in 1990. By my math, that has allowed cities (such as Portland) twenty-four years to get into compliance. Now I admit, this image is a couple of years old now, but it shows what I found on the Portland State University Campus in February 2011. I find it pretty pathetic that in a city as large as ours, and on a campus such as ours, issues faced by people with disabilities had been ignored by so long. A few photos, some emails, and a phone call or two (plus a year to get it done), and things had improved greatly. The ramp was finished in late August 2012. Now for another type of storm drain grate hazard... I call them black holes. Black holes are typically created when a road is repaved repeatedly, and the grate is not raised to the current surface level. Settling of the soil below/around a catch basin is the other major cause. Now I realize that it may be hard to see this in the image to the left, and that's the point. It's hard to see. The dappled sunlight from this tree completely obscures the storm drain grate. The effect is even more pronounced when you're actually riding, as you eyes don't have the opportunity to adjust from the bright sunlight to the shade before you are already caught by this trap. The 2nd photo does a better job of showing the hazard. This drop of several inches turned out to have caused several serious crashes as I found out later. I repeatedly tried to get ODOT to fix this for a number of years, but my requests fell on deaf ears. When I encountered again, unfixed after a number of months of repeated phone calls, and emails, I decided to take things into my own hands. I painted it. As I was doing my work on making this issue more visible, the adjacent homeowner came out and told me that several cyclists, joggers, and skateboarders had been hurt when they fell because of this. Including one the week before. I told him that if it ever happened again, to notify the victim that ODOT had been notified of this, and they should have their lawyer investigate this by contacting me. BikePortland picked up the story, and ODOT replied quickly, not in a manner that I had expected though. I figured that they'd "improve upon" the paint that I laid down. They improved upon it alright. 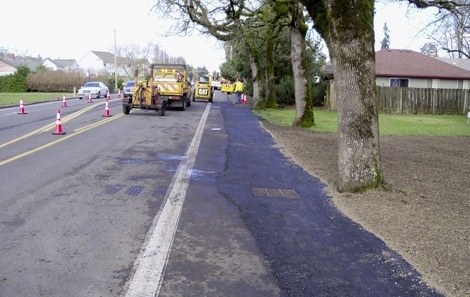 A week after BikePortland's article, ODOT dispatched a crew, and repaved the section completely eliminating the lip that was causing the accidents. I find it amazing what a single person with time, a computer, a phone, a camera, and some basic tools (Swiss Army Knife, saws, pruning shears, pruning lopers, and spray paint) can achieve. One person can do a lot, but when you team up with others, even more can be done... I encourage people to go out and speak for what they want and need. Behold, SW Lombard Ave. Beaverton Oregon, March 5, 2010. A public hearing was held to talk about adding a bike lane here. Most of my neighbors were against it, I went to the hearing, sat through all of their testimony, and made notes. I was called last. Using the notes I had just taken, I was effectively able to destroy every legitimate argument that was presented by them (too costly, will decrease property values, will make the road more dangerous), save one (I'll lose my parking in front of my house). My argument against that was simple. 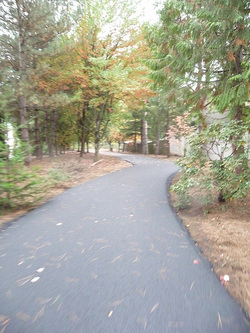 It is a public road, a public right of way. Not a "Public Right of Parking". It's not private property, they have no special rights over any other user of the ROW. 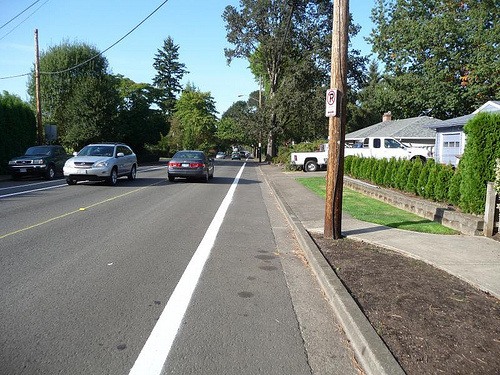 Happily, the city of Beaverton ultimately decided that the bike lanes were more important to the public than the few (on average less than 9) cars parked on the street. Another way to get involved, is to get involved. 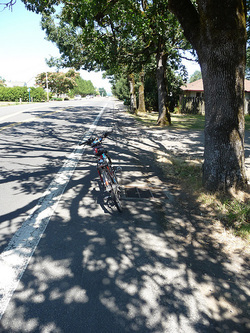 As a former member of Ashland's Bike Advisory Committee, and a sit-in contributor to Beaverton's Bike Advisory Committee, I've been able to express my needs and concerns to the cities I've found myself in. 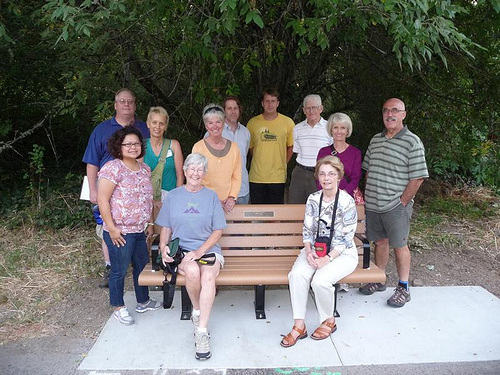 As a member of the Tualatin Parks and Recreation Trails Advisory Committee, I was privileged to be involved in the process of getting new and improved off road trail systems approved for the people of Washington County. I realize that much of what I posted is older than summer 2014. However, I was forced to curb some of my activities due to an unexpected medical reason. As you can see, this rogue has been at it for some time. You can be certain, I'm not planning on quitting anytime soon. As it says in Walk Out Walk On... Start Anywhere, Follow It Everywhere... I'd add "and make it better as you go". *"Somebody Else's Problem field, or SEP, is a cheap, easy, and staggeringly useful way of safely protecting something from unwanted eyes. It can run almost indefinitely on a flashlight/9 volt battery, and is able to do so because it utilizes a person's natural tendency to ignore things they don't easily accept, like, for example, aliens at a cricket match. Any object around which a S.E.P is applied will cease to be noticed, because any problems one may have understanding it (and therefore accepting its existence) become Somebody Else's. An object becomes not so much invisible as unnoticed." - Douglas Adams. **“Oregon Revised Statutes 810.150. 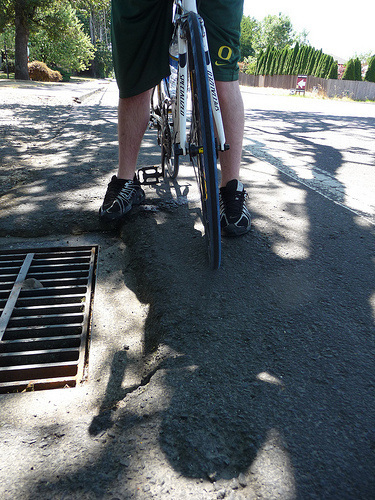 Drain construction; compliance with bicycle safety requirements; guidelines. (1) Street drains, sewer drains, storm drains and other similar openings in a roadbed over which traffic must pass that are in any portion of a public way, highway, road, street, footpath or bicycle trail that is available for use by bicycle traffic shall be designed and installed, including any modification of existing drains, with grates or covers so that bicycle traffic may pass over the drains safely and without obstruction or interference.